OR YEHUDA, Israel, Nov. 13, 2014 /PRNewswire/ -- Formula Systems (1985) Ltd. (NASDAQ: FORTY) a global information technology company principally engaged, through its subsidiary and affiliates, in providing software consulting services, developing proprietary software products, and providing computer-based business solutions, today announced its results for the third quarter and first nine months of 2014. Net income for the third quarter increased 20% to $6.3 million, or $0.43 per fully diluted share, compared to $5.2 million, or $0.36 per fully diluted share, in the same period last year. Revenues for the third quarter amounted to $153.4 million. Revenues for the third quarter showed a decrease due to the deconsolidation of Magic's and Sapiens' results of operations, which were previously consolidated during the third quarter of 2013, and which continue to be accounted for under the equity method of accounting. Formula's non-GAAP comparable pro-forma revenues, had it continued to consolidate Magic's and Sapiens' results of operations for the third quarter of 2014, would have totaled $234.0 million, compared to $197.3 million in the same period last year, reflecting a year over year increase of 18.6%. Operating income for the third quarter amounted to $9.9 million. Operating income for the third quarter showed a decrease due to the deconsolidation of Magic's and Sapiens' results of operations, which were previously consolidated during the third quarter of 2013. 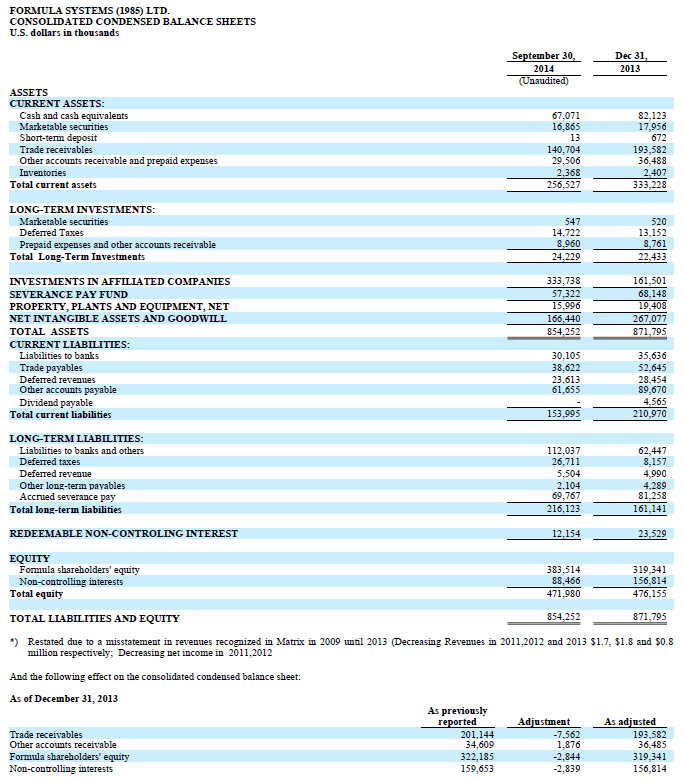 Formula's non-GAAP comparable pro-forma operating income, had it continued to consolidate Magic's and Sapiens' results of operations for the third quarter of 2014, would have totaled $17.9 million, compared to $14.8 million in the same period last year, reflecting a year over year increase of 20.9%. Formula held 45.2% and 48.4% of the outstanding shares of Magic and Sapiens, respectively, as of September 30, 2014. Net income for the first nine months of 2014 amounted to $66.3 million (or $4.57 per fully diluted share) compared to $14.3 million (or $0.99 per fully diluted share) in the same period last year. Net income for the nine-month period was positively impacted by a net gain of $61.4 million recorded in relation to Formula's loss of control in Magic Software offset, in part, by the $5.3 million loss recorded as a result of the decrease of Formula's beneficial ownership percentage in Sapiens from 48.8% to 46.95% due to the exercise of employee stock-based compensation and warrants. Revenues for the first nine months of 2014 amounted to $474.4 million. Revenues for the first nine-month period showed a decrease due to the deconsolidation of Magic's and Sapiens' results of operations, which were previously consolidated during the same period in 2013. Formula's non-GAAP comparable pro-forma revenues, had it continued to consolidate Magic's and Sapiens' results of operations for the first nine months of 2014, would have totaled $684.5 million, compared to $587.2 million in the same period last year, reflecting a year over year increase of 16.6%. Operating income for the first nine months of 2014 amounted to $25.2 million. Operating income for the first nine-month period showed a decrease due to the deconsolidation of Magic's and Sapiens' results of operations, which were previously consolidated during the same period in 2013. Formula's non-GAAP comparable pro-forma operating income, had it continued to consolidate Magic's and Sapiens' results of operations for the first nine months of 2014, would have totaled $44.7 million, compared to $43.4 million in the same period last year, reflecting a year over year increase of 2.8%. From August 21, 2014 through September 16, 2014, Formula purchased an aggregate of 736,862 Common Shares of Sapiens through broker-initiated and private transactions for an aggregate purchase price of US$5,757,192, which, combined with its previous holdings, represent 48.5% of the total issued and outstanding Common Shares of Sapiens. Consolidated cash and short-term and long-term investments in marketable securities totaled approximately $84.5 million as of September 30, 2014. 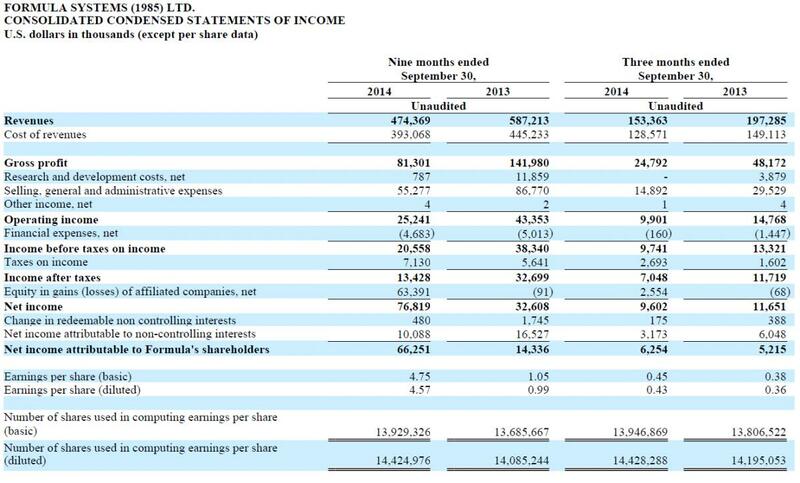 Formula stand-alone net debt as of September 30, 2014 amounted to $25.0 million. Total equity as of September 30, 2014 was $472.0 million, representing 55% of Formula's total assets. Commenting on the results, Guy Bernstein, CEO of Formula Systems, said, "We are pleased with our strong performance across our portfolio during the third quarter. Matrix continues to show steady top-line growth with revenues increasing in the third quarter by 14% year over year and during the nine-month period by 12% year over year. Matrix's operating income grew 25% during the third quarter to reach $9.9 million as the company benefitted from increased demand for its services and increased its market share internationally and across all its Israeli markets. Backed with $85 million in cash and short-term investments, Magic maintained its double-digit growth momentum throughout the third quarter and the first nine months, with strong performance in sales and profitability across its products and professional services. Magic finished the first nine months with record revenues for the period of $121.8 million, up 17% over year, and record non-GAAP operating income for the period of $18.9 million, up 19% year over year, and reasserted its revenue guidance of $161 million to $165 million for the full-year 2014. Sapiens produced another record quarter with revenues of $40.4 million and non-GAAP operating income of $4.4 million, up 16.7% and 22.6%, respectively year over year. With total cash and investments in marketable securities of $78.4 million, Sapiens continues delivering strong revenue growth, improved profitability and cash flow, and an expanding pipeline of opportunities, allowing it to maintain confidence in its ability to deliver the high end of its guidance of $154 to $158 million of revenues for the full year".